Taking a home on rent is as hectic as buying a home. Every step should be taken with proper care and intelligence. It is really a big decision so just take care of some things and ask yourself some question about your lifestyle, previous locality and your personal advice for the new home. Is it perfect as you wanted? according to your will and many more question. All the above-mentioned questions are very needed to answer as your decision will affect your life, so it is always better to take the time to make the wrong decision. 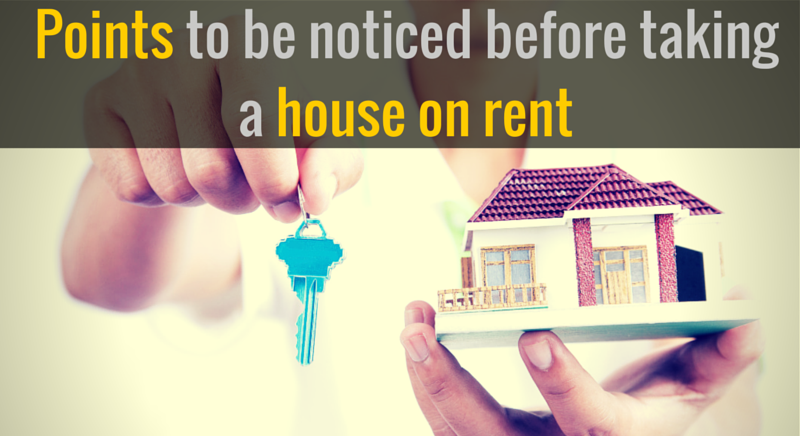 Here we are going to discuss some important factors should be noticed before renting a house or property. Search the house on the local listing sites: Make an on-line search on Internet for rental property. There are several sites which provide listing of several latest homes available for rent, so just make a search and try to find the right home. It is also advisable because these sites provide whole about the property also so need not also to visit here and there for searching the home. Check the locality: investigate the area properly where you are going to move, ask about it to friends and familiars, visit the area twice or thrice so that you can also assess it and take decision by own. Budget: What is your budget? How much can you spend monthly on rent? Will you be able to manage rent If there occurs an emergency? Answers of all these questions will help you to be limited in your budget. Comfortability: Will you be comfortable with the new home or not? Is it far from your office? How convenience facility is? The space of a new home is enough or not? If you ignore these questions and chooses the house then the chances are higher that you have to search new home just after some time. Facilities: What facilities are being provided by the landlord, notice all of them like water facilities, electricity, parking, and others. Ask clearly all these are free or you will have to pay for these other than rent. Hidden charges: Ask about hidden charges, there should be no hidden or extra charges for anything if there then consult. Agreement: Before signing the agreement, read and understand it clearly and ask about the outcomes if you want to change the house before the end of the bond. Make a note of inventory: Make a proper note mentioning, what inventory or furniture are given to you at the time of taking the key of the house. Time of next increase in rent: Know about the increment in rent and time when it will be imposed.